after waking up and doing 4 hours of macromedia director work, i ate some lunch (toaster oven chicken wings), took a shower, and drove to the bed bath & beyond in burlington to return a rug i no longer wanted. the parking lot was sort of empty which surprised me initially, but after i thought about what time it was (in the middle of the day on a thursday afternoon), not too many people are out shopping. afterwards i went to the sports store next door to see if they carried any smaller sized red sox baseball t-shirts. they only had a few on the rack, all of them the wrong size. i failed to mention that my sister left for china yesterday, going as a translator with a friend of hers who's adopting a 3 year old chinese girl. and then tomorrow my parents are leaving for taiwan and china as well, i have to wake up at 6am to drive them to logan airport. i will be the only person in my family who's left in town, probably one of the rare times that this has happened. there's probably going to be a lot of commuting back and forth between cambridge and belmont, taking care of both houses, turning on the lights, picking up the mail, things of that nature. because my father's leaving tomorrow, today was the last day he could help me work on the house before his almost three weeks trip to asia. that's why yesterday he helped me move the fridge and file down the door, things that i can't do on my own. the only thing left to do today was to fix a broken windowsill trim in the master bedroom. we added a new layer of sheetrock and covered up the repair work with a layer of joint compound, to be sanded by me tomorrow before i nail back the trim (or maybe i could buy a new one, that one is sort of cracked). this weekend i hope to prime the rest of the house. i'm not sure why all this painting is taking so long. maybe i'm too fixated on details, but i see and hear painting stories and it seems pretty effortless, especially for the priming layer, where you basically throw on the white paint. but i'm in no particular rush, other than the anticipation of finally moving into the house full time, but i've waited this long, it's not like i can't wait a few more weeks. one thing i've noticed that i've been doing is closing all the windows when i leave. in the past, i really didn't care because it wasn't like anyone was going to break in, there's nothing inside to steal. but now with the new floors and the place pretty much all done other than painting, i've become more careful with the house, and i close the windows partly for security but partly to keep the elements out, like if there's suddenly a rainstorm. 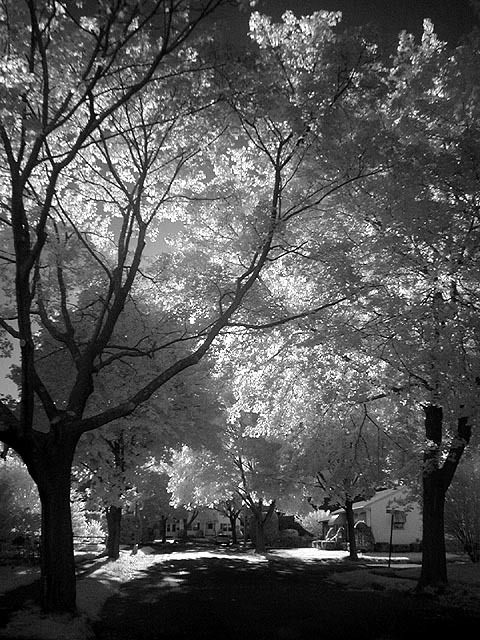 finally, with sunnier late afternoon weather compared to yesterday, i ventured out and took some infrared photos of my street in belmont. 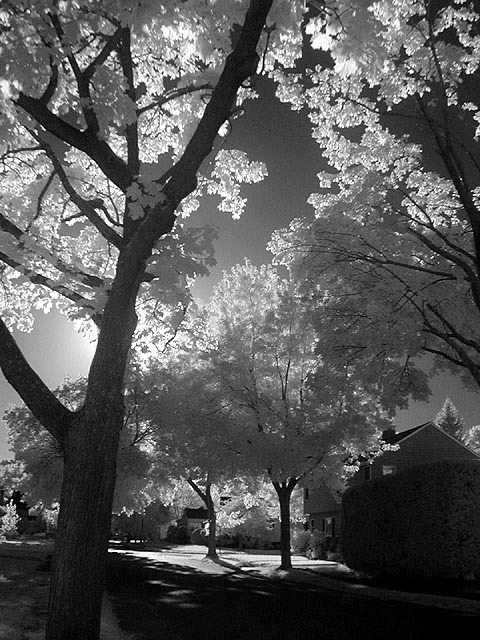 would you believe that there use to be even more trees on my street? over the years, through hurricanes and snowstorms, their population has dwindled down.